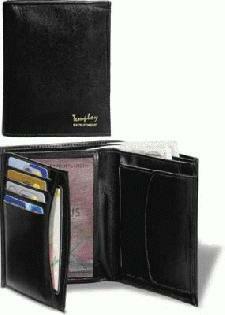 Advertise your companies details on our range of various Wallets with logo. Area available for printing your companies details and logo. So why not advertise your buisness details on side one of our Wallets with logo today! This particular wallet is a 3 fold black leather wallet with credit card slots, a purse, notes holder plus an identity pass window for your buss pass etc. Other promotional and personalised items besides our Wallets with logo click here. For more information prices and samples on ourWallets with logo click here and fill in the contact form and we'll be in touch as soon as we can.